We’ll also give away $250 in District Dollars at each Blues event this summer! Tickets on sale $10 each or 3 tickets for $20 at Blues in the District, at The District office and at the weekly Saturday Farmers’ Market in Washington Park. Support Blues and all the events brought to you by The District! The concerts are held in Washington Park 5:30pm – 9:30pm and are free to the public. The District is a volunteer driven, community non-profit developing programs to promote an enhance Quincy’s historic downtown. Raffle tickets sell for $10 each or 3 tickets for $20. 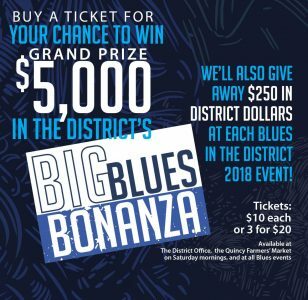 Each ticket sold will go into the drawing for the grand prize of $5000, to be given away at the end of the final Blues in the District event on Friday, August 24, 2018. Prizes of $250 in District Dollars also will be awarded during each Blues in the District event. District Dollars are redeemable at many shops, restaurants, bars and businesses in The District. See our Facebook page and website for a complete list of participating businesses. All District Dollars must be redeemed by June 1, 2019. District Dollars are not redeemable for cash. Winners of District Dollars will still be eligible to win the grand prize. Odds of winning depend on total number of entries and number of tickets purchased. The more tickets you buy, the better your odds of winning. Need not be present to win. Winner will be notified. Must be at least 18 to participate in the contest. In the event enough tickets are not sold to cover the prize costs, The District reserves the right to award 25% of the total amount collected as an alternate prize. Employees of The District and members of its Board of Directors are not eligible to win.